6. THE BASICS 2: SO WHAT’S UP WITH DVD SALES? This post complements the previous one, which dealt with box-office stagnation. Before you get alarmed by the following graph – let me just say that there is better news right after it. I plotted this one using data from The-Numbers.com, which logs DVD sales. 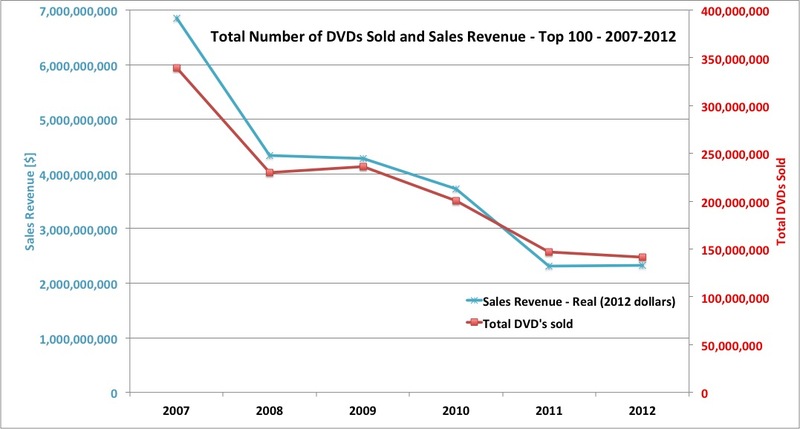 The figures may vary depending on the different sources, but the trend is clear as daylight: DVD sales are crashing. When coupled with the box-office stagnation shown in my previous post, it may seem like the industry is on the fast track to its total collapse. DVD sales are not everything. There is BlueRay and there are rentals and there are streaming services. In my next post I will show that this is not the end of the world (hint: it’s the streaming services that will save the day). Stay tuned.